My research specialisation is Numerical Analysis. • problems with random inputs. Areas of application include linear elasticity, electromagnetism, groundwater flow modelling, and quantum mechanics. 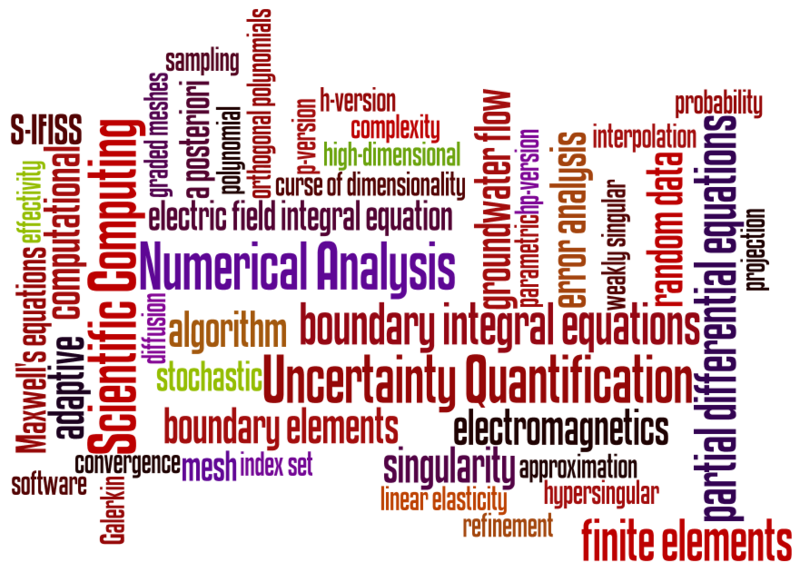 This joint project with collaborators at The University of Manchester focuses on the development of robust, accurate, and practical numerical methods for solving parameter-dependent PDEs stemming from uncertainty quantification models. Postdoc at Birmingham: Dr Feng Xu. Leonardo Rocchi (since October 2015). Project title: "Adaptive algorithms for partial differential equations with parametric uncertainty". jointly supervised with Dr Daniel Loghin. Project title: "Domain decomposition methods for PDE problems with random inputs". Matthew Williams (MSci project, 2014 – 2015). Project title: "Stochastic sampling methods for PDEs with random input data".